TAKE THE PREMIUM HYBRID CHALLENGE. We challenged the thinking that mechanical fiber can’t be used in high quality publishing applications because it will revert or yellow. 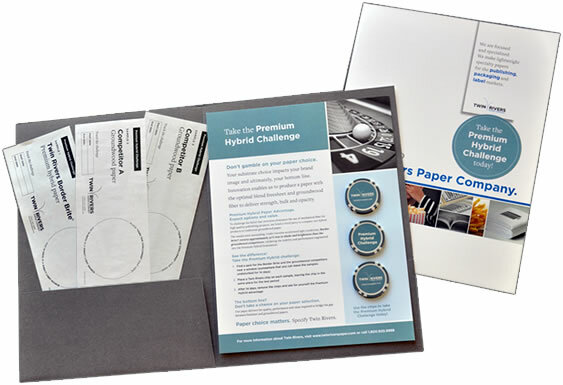 The result is a new generation of paper: Premium Hybrid. This innovative paper delivers publishers and printers choice. Our Premium Hybrid offering is formulated with the ideal amount of groundwood content to deliver strength, opacity and value without sacrificing the quality and stability associated with our freesheet papers. It’s the perfect blend. Now we task you to see for yourself by taking our 14 day challenge. Expose our paper alongside groundwood competitors to direct light and experience the difference. Order your Twin Rivers Hybrid Challenge Kit today! The bottom line? Don’t gamble on your paper choice. Substrates impact your brand and ultimately you bottom line.